What did I expect? A movie a lot like the original Planet of the Apes, but lamer. What did I get? So far in 1970, we’ve encountered four undeniable classic movies, one movie of considerable historical importance, and an extremely successful entertainment. Those movies are typical of #1 movies, but they’re only part of the story. “Ordinary,” even “bad” entertainments, with their attention focused squarely on making money from the great mass of middle American moviegoers, that’s a major part of it too, perhaps even the main part. When I started this blog, it wasn’t so much They Shoot Horses, Don’t They? I was interested in, it was Beneath the Planet of the Apes. So here we are. I’m not a great student of genre sci-fi movies, so take this for what it’s worth, but I like Beneath the Planet of the Apes better than the original movie. The problem with Planet of the Apes is that so much depends on a central premise — that it never occurs to Charlton Heston that he’s on Planet Earth — that beggars belief, and the plot, mostly about Heston’s incarceration and humiliation by the apes, isn’t really very engaging. Like a lot of Rod Serling’s work, Planet of the Apes has pretensions of depth but its points are actually very obvious. This is a major explanation for the franchise’s extraordinary success, in my opinion — it’s “deep” but not really deep at all, anyone can grasp it. To be fair, the thematic substance of Planet of the Apes does have a pleasing unity and simplicity and richness, it’s silly to deny it. 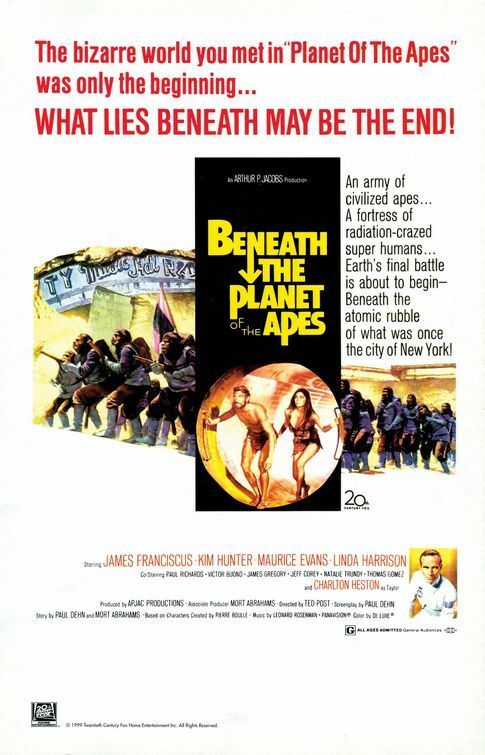 But Beneath the Planet of the Apes has a blander, but to my thinking better, lead actor in James Franciscus, and the plot is more varied and interesting. The apes’ political rally, with the orangutans, gorillas, and chimpanzees segregated and wearing color-coded uniforms, is more visually striking than anything in the original, as are the military sequences. The movie goes literally “beneath” the world of the apes in a network of caverns (actually the quondam NYC subway system) populated by some telepathic and grandiloquent Übermenschen who are pacifists and for some reason worship a nuclear device, even though they are all severe victims of nuclear fallout. Beneath the Planet of the Apes has an excess of thematic material, and a lot of it’s incoherent, but I found the movie rather watchable. I can’t really defend the premise that it’s better — it does have the stink of lameness about it — but I did enjoy watching it more. What here smacks of 1970? The Cold War moralism about nuclear weapons. IMDB synopsis: Astronaut Brent is sent to rescue Taylor but crash lands on the Planet of the Apes, just like Taylor did in the original film. Taylor has disappeared into the Forbidden Zone so Brent and Nova try to follow and find him. He discovers a cult of humans that fear the Apes’ latest military movements and finds himself in the middle. Tension mounts to a climactic battle between ape and man deep in the bowels of the planet.